First we'll cover the big news: 'City' is back, better than ever before, 'Fort Magma ' has been totally remade, and oh! Did I mention they look gorgeous? Woah, slow down a bit! What's all this? New nitro bar and zipper icon? And more spicy looking nitro? And what's that kart in 'Fort Magma'? Is it new? To all of that I have to answer: yes, yes and yes! 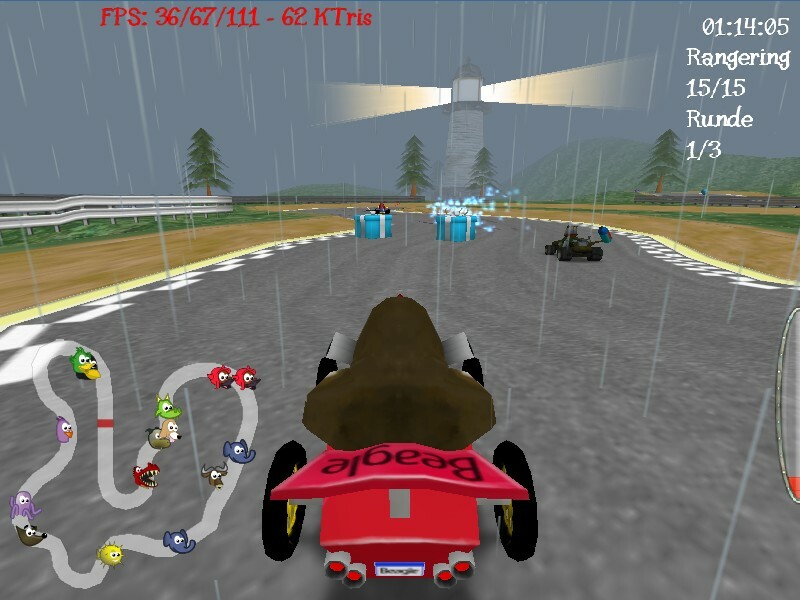 The kart is called 'Beagle', and it's a brand new one made by wolterh. Now you might want to ask where the kart rank display, speedometer and action messages went. They went the way of the dodo. Or, to put it more elegantly: in an effort to minimize UI clutter and better the racing experience, these elements were removed. As of now, it's still not the default look, but it is quite likely to become so in the near future. We would love some feedback on this, as it's always risky to remove stuff people are accustomed to, and this might very well become at least somewhat configurable. But we will listen to any praise/criticism and try to balance this well for the upcoming 0.7.1 release. 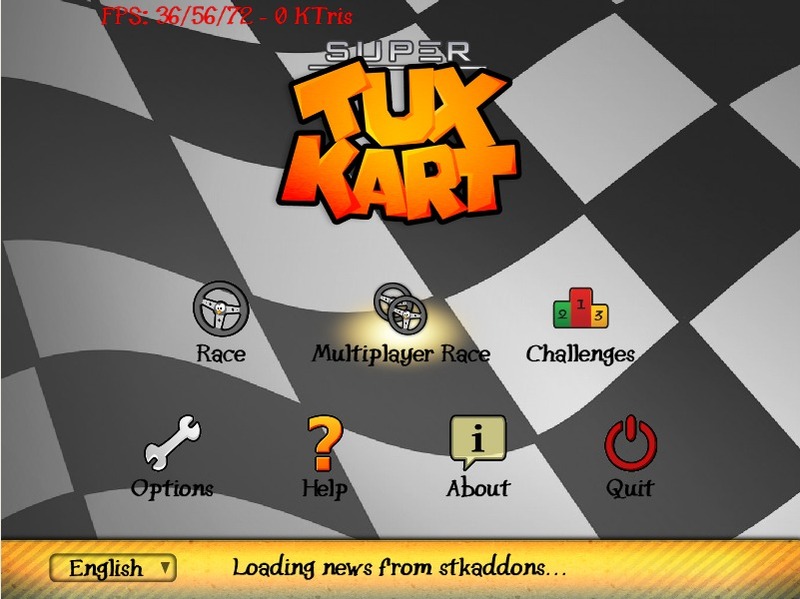 And if you're afraid that your computer can't handle the extra load, you will find a new slider in the graphics options that'll hopefully make STK still run perfectly well. You can now even have kart animations only for the human players, thus removing the overhead of animating all the AI karts in sight. Also, the loading notice has a connection to the new feature of installing addons in-game. While hiker has been working quite a lot with this, and certainly deserves more than a few lines, I'll keep it short and simple for this time and cover it more later. The thing is; we need your help. We are looking for a server side programmer capable of PHP, generic web design and compilation of STK (we'll provide help with this if needed). The game side of things is mostly in place, but the server side will need a bit of work, so if you have the aforementioned qualities we would really like to hear from you. You'll have to cooperate either through the mailing list (preferred), and/or IRC. Installing addons in-game might be delayed until 0.7.2 or later, depending on how quickly we can get someone with the necessary skills and time to help. That's it for this time - there have been more changes, but I'll try to fit them in another post instead of making this one a mile long. Take care, and let us hear from you regarding the latest changes - using the forums is a great way to do it as we can keep the discussions organized. I hope you make the in-race UI customizable, because I was actually hoping for getting more information on there. I reckon it's pretty handy when I do a 20-cart tournament to be able to see how my competitors are faring in that particular stage. I don't want to be such a critic, but the Nitro bar seems to be out of the screens and it doesn't look good for me, it's ugly. Nitro bar in 0.7 is more than nice! Most computers today have widescreen, why do you put that effort in minimizing the race-in UI? Anyway, I will never get tired of saying that this is my favourite game for Linux, and the fact that it's becoming greater and greater version after version really excites me! NOOOOOO, please don't take away ranking and speedometer. They are really useful tools! It would be really uncomfortable to be looking at the little map just to know in what position my friends are! 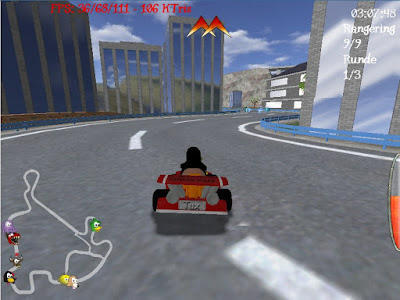 Speedometer is a classic in every racing game, why do you want to remove it? Nobody needs the part of the screen where it is anyway!! Awww I liked the speedometer and action messages. They really added a lot of charm to the game! I liked the kart location thing too. I wouldn't mind the UI being customizable as others have already said. That's probably the best way to go. Glad to see Beagle in the main game, that's the one I use the most. "reckon it's pretty handy when I do a 20-cart tournament to be able to see how my competitors are faring in that particular stage." "Also the speedometer is really necesary, ... also to see if I am using nitro in an efficient way since I control it depending on my speed. Action messages were really funny!" "please don't take away ranking"
The ranking is still there - once as a (in the final version more visible) display for each player, and secondly in the map (which in the final version player karts will be easier to see as well). "It would be really uncomfortable to be looking at the little map just to know in what position my friends are!" The map is already bigger, and player karts will be better identified as well. "Speedometer is a classic in every racing game,"
On what is this statement based? 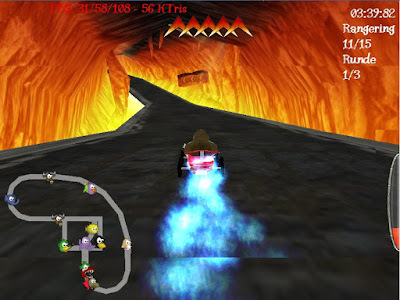 Mario Kart Wii, MK 64, and Diddy Kong all don't have a speedometer (iirc). Thanks a lot for all your feedback - please keep it coming! "Imho the fact that you can try to efficiently use nitro indicates a problem with STK: it is often just too boring. I see STK more towards a frantic driving & pushing game then a controlled "How can I fine tune my nitro usage" - more a game of reflexes than a game of micromanagement. Once we have reached this, there simply won't be time to look for those things - I hope :)"
Well, yes. that is quite true. It should be that: when you aren't either ahead of the other karts, or behind the other karts. When you don't have to worry about others, you don't want to be wasting nitro. Would you fire five muffins just to make sure you hit someone once? No. Unless the target is moving *really* oddly. Okay, I will also say something else: Me and my brother race against each other often, and we never include AIs in that. They aren't smart enough. Not even the expert ones. I don't look at the speedometer anyway, just have a feeling on how fast I am driving. I agree that AIkarts aint good enough yet, although there's a significant difference driving with 3 contra 19 AIs. Hey Hiker, the game is not only for yourself, is it? "As stated above: the fact that people are using the speedometer to fine tune their driving runs just opposite to the direction I see STK developing :)"
By making the UI customizable you are letting your users to play however they want to play. About myself I'm not such a good player and I try to fine tune my driving because IT'S A RACING GAME and because if I don't then I will surely finish in the latest positions. There are several kinds of users, and I don't think the game becomes boring if you have time to read action messages and use nitro efficiently, that's personal. "That's exactly why I removed the icon display - it just doesn't work anymore if you have many karts, while a larger map would give similar information much better"
I don't mind having only the first 8 or 9 positions in an icon display, those are the positions that matters anyway. Looking at the map IS JUST TOO UNCOMFORTABLE. And if I have time to look at the map then why would'nt I have time to read action messages? Actions messages are one of those details that make this game so charming, they don't bother anyone and you only need half a second to read them. Listen to your fans, most comments here disagree with minimal UI. We really like Rank, Action messages and Speedometer and if those items are removed, then a feeling of emptyness and dissapointment will be created. Conclution: I hope that if those items are removed from the default UI at least they will be optionals. Goodbye, and thanks for making STK possible! Grego, you probably haven't even tried the minimal race UI, and you are still able to make it sound like the end of the world? Also, this is a work-in-progress screenshot, and there are still improvements to come. Furthermore, it looks like I misinterpreted what hiker said earlier, and it may very well be that it will be optional or perhaps even not at all. Personally, I think the minimal race UI is better, since there really is too much clutter and attention-grabbers. Rank icons are not needed at all once the improved minimap is in place, and you'll still have the 'Rank: 1/20' text if you don't like it. I don't need to see visually how my speed is improving with nitro - I know it does! I just use it in small bursts as before, and the efficiency is still pretty high. And the action messages are a real pain to translate and adds much overhead. I currently building a motorcycle for stk. And I was wondering how you add a animal or thing onto the kart. Also on newer UI I never used the speedometer, but maybe you could have a text for that. That new nitro bar is much better. Can we download the new fort magma? or .7.1 ? Sorry for making two comments. What Open source program would fit well with a motorcycle? maybe you could consider the forum instead of the blog for questions, the blog is really for comments, not questions. Hi I'll use the forum! Thank you for the /your information.